If your child has special needs or an intellectual disability, it can be difficult to insure they get the proper care when it comes to their dental needs. Children can be very intimidated about going to the dentist, so it’s important that you find a pediatric dentist specializing in children with special needs who understands the unique challenges of treating these children, including the need to spend extra time and care to make their visit as enjoyable as possible. To insure your child is getting the proper dental care needed, below are some suggestions on how to work with your child on their dental health and daily oral care routine. 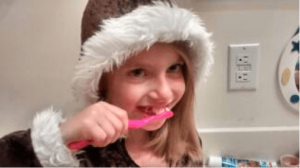 Kids are great at making everything fun, and brushing should be fun for them too! To help engage your child in daily brushing, try making a game out of it. Have them make funny faces as they brush and take their picture for the two of you to giggle over later. Make up a brushing song that they hum while they brush. Give them special rewards or treats if they do a good job brushing. Insuring that daily brushing becomes routine and non-threatening for your child is critical to good oral health. Children with learning disabilities or other special needs learn habits by watching their parents or siblings, so why not make brushing or teeth a family event? Whether it’s just one parent or caregiver, or the whole family, including the child in this one routine will help them understand the importance of brushing, as well as how to do it correctly, by doing what you’re doing. It’s all about making it a habit. Depending on your child’s special needs or disability, they may have difficulty holding a brush, which can lead to frustration, tears, and a complete unwillingness to brush. Dr. John Hendry makes a great suggestion of using “toothbrushes can be adapted with a Play-doh grip, a bicycle grip or even a tennis ball.” Anything that makes brushing more enjoyable for your child, as well as easier, is critical to making sure they brush. Does your child have a stuffed animal or plush toy that they adore? Get them comfortable with the idea of brushing their teeth by brushing the “teeth” on the stuffed animal. Show them how to brush, and explain to them how much their favorite stuffed toy loves having nice clean teeth! You can even give the brush to your child and let them brush their beloved toy’s teeth. Make it fun for everyone! Regardless of how wonderful your child’s oral care is at home, at some point they have to go see their pediatric dentist for a check-up. Professionals that specialize in working with children with special needs or learning disabilities understand that they need to make a trip to the dentist fun and non-threatening. Ask your pediatric dentist about “pre-visits” where the child can come in and just check out the surroundings. Make sure the visit is a pleasant one, including meeting the dentist and any other staff members they’ll be interacting with. You can even prepare your child for their first dental office visit by building excitement around the event. Put stickers on the calendar for the day of the visit. Drive by the office. Chat it up as a fun and wonderful event. Make sure the first visit is as short as possible, and slowly build up to the time needed to get your child adequate care without getting them frightened. Oral health is important for all children, regardless of their physical or emotional challenges. Understanding how to make dental care an enjoyable part of their daily routine will go a long way to insure a healthy smile for years to come.